During selected weeks throughout the season, The Swag provides unique guest speakers and other events of special interest. Each program is optional and there is no additional charge for participation unless otherwise noted. These events are a memorable addition to any vacation in western North Carolina. Please note that the first date listed below is when the event leader(s) arrive, and the second date is when they depart. Their activities for those days may not be scheduled due to their arrival/departure time. Join singer/songwriter and Southern Appalachian Naturalist Doug Peters and his hiking partner and wife, Kathy, for an unforgettable experience at The Swag. Since 1986 Doug has delighted guests at The Swag with his original songs about life, love, and adventure. His unique lyrics capture the history, beauty, and special character of The Swag and the Smoky Mountains in ways that will both tickle your funny bone and tug at your heart strings. Join Doug and Kathy on the trails by day and by the fire at night. Dr. Bob Collier, a nature writer and avid birder for more than 30 years, will offer pre-breakfast birding on the lawn and half or full-day nature hikes focusing on birds and wildflowers of the Great Smokies. Bob and his wife, Louise, have been with The Swag since 2002, and they look forward to sharing their knowledge and love of the Smokies with you. . Since 1999, this popular husband and wife team has led daily hikes. Dr. Pelton is the foremost authority on the North American black bear. Dr. Willis has a Ph.D. in Science and Environmental Education, and she has a special love for the “unhuggables” (snakes, bats, and insects). At day’s end, they will conduct a presentation on Southern Appalachian mammals such as black bear and bats, natural history and ecology. Join us as our Executive Chef and The Swag culinary team lead four informative cooking lessons to cover a range of foods. Classes will be informal and hands-on with plenty of opportunity to interact with Chef. All equipment will be provided, including a complimentary Swag Chef Apron to take home with you. By popular demand, The Swag’s Cooking School will be offered three times in 2018! There is no additional charge for Lodging Guests. Renowned storyteller Donald Davis hails from Western North Carolina. Featured at festivals throughout the U.S. and the world, Davis is also known as a prolific author, producer of books and CDs, and as a guest host for NPR’s Good Evening. He will take hikes and tell stories about the uniqueness of the place and the people who have lived in these mountains. Folks love their Dutch Oven cooking during the hors d’oeuvres time in the Dogtrot. Donald and his late wife, Merle, have been a part of The Swag family since 2006. Outdoorsman, author, and storyteller Charles Maynard returns to The Swag for more fun than seems possible. Charles will lead hikes in the day and regale us with his fabulous storytelling each night. His newest book Blue Ridge – Ancient and Majestic is a must for mountain lovers. This is a wonderful event for those who seek to expand their knowledge of the Smokies. Esther has a thing about birds, wildlife, and wildflowers…and her enthusiasm is contagious! Her “Walks in the Woods” will have you laughing, crying, and thinking. Esther is a master naturalist, elk expert, and certified interpretative presenter for the National Park. Most of the year, you can find her leading hikes and eco-tours in Cataloochee Valley, representing her business, Cataloochee Valley Tours. With more than 50 combined years of backcountry experience, Joel and Kathy Zachry joined The Swag as Special Event Leaders in 2013. Authors of Bears We’ve Met, they completed the 2,175 mile Appalachian Trail in 2005. The Zachrys are instructors and directors of the University of Tennessee/National Park Service Smoky Mountain Field School. This energetic couple will lead Swag guests on daily hikes and conduct evening presentations on the culture, history, wildlife, and vegetation of Western North Carolina and Great Smoky Mountains National Park. Artist and hiker, Gay Bryant, will lead Swag guests for morning hikes on various trails, sharing her knowledge of wildflowers, plants, and Smoky Mountain lore. In the afternoons, you can explore your creative side with beginning-level lessons in watercolor painting and relief printmaking to create original artwork that will document your stay at The Swag. Gay has been a studio painter, printmaker, and art instructor for 30 years and her work is represented in regional galleries and international collections. She has hiked all 900 miles of the official trails in the Smokies and creates work focusing on the natural beauty of the forests. Gay will be assisted by Rita Rothmeier, a naturalist, painter, printmaker, spinner, fiber artist, nurse, and outdoors enthusiast. Children must be at least 12 years old and under the supervision of an adult to participate in the art class. Outdoor adventure photographer, Steve Yocom, will lead Swag guests on guided hikes and share photography skills. Whether a guest brings a nice camera or is using their iPhone camera, Steve will share tips that will make anyone a better photographer and enable them to capture some of The Swag’s great moments: the Smoky Mountains, wildflowers, sunrises, autumn leaves, and more. Steve’s work has been featured in a number of publications and websites including the cover of BACKPACKER Magazine, Visit North Carolina, and Blue Ridge Outdoors. Growing up in the shadow of the Swag had a profound impact on Steven’s life. 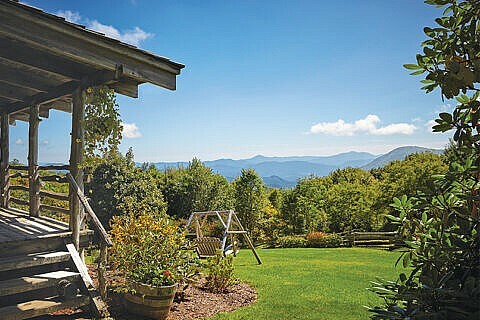 The view from his childhood home was dominated by the Cataloochee Divide – home of the Swag. Every year of his youth, his family would cross over the Cataloochee Divide and host a family reunion down in Cataloochee Valley. For him, the Divide served as a gateway to exploration and he would get so excited when he would cross it because he knew it was time for an adventure! Flash forward to the present and he still feels the anticipation of adventure and a visceral excitement every time he approaches the Cataloochee Divide. He’s hiked, climbed and snowboarded on many, many mountains. Steven has served as a wilderness mentor, volunteered abroad, climbed to raise money for charities, hiked around the globe, and even opened up his own guiding service – Appalachian Outdoor Company. When hiking with Steven you will learn the history of these hills, explore the geography of the Great Smoky Mountains and hear the tales of local lore and much, much more! Lynda has spent the last decade-plus at the Supervisory Park Ranger at the Oconaluftee Visitor Center in the Great Smoky Mountains National Park. Her career with the National Park Service has taken her far and wide, including time spent at Cape Cod National Seashore, Yosemite National Park, and Point Reyes National Seashore. As an interpretive ranger, Lynda focused on education and events that would help visitors appreciate all that the Great Smoky Mountains National Park has to offer. Lynda will share her deep knowledge of these mountains, its creatures, and its history with our guests. She will lead day hikes, night hikes, and more! For more information regarding any special event, please call (828) 926-0430 or (800) 789-7672. Our off-season business hours are Monday – Friday, 9 a.m. to 4 p.m. Eastern Standard Time or you can email us.